Quick: What are the Bill of Rights? Watch this movie and you’ll understand what I’m talking about. It usually takes until after the Oscars for me to find a movie from that release year that I really connect with. 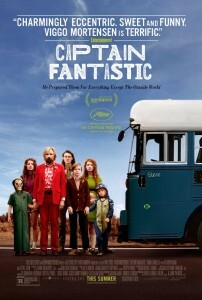 “Captain Fantastic” is that 2016 film. Ben Cash (Oscar-nominated Viggo Mortensen) and his six children live in the wild on land they own in the Pacific Northwest, completely detached from the rest of the world. The children’s names are intentionally unique (Bodevan, Zaja, Nai, Keilyr, Vespyr, Rellian)1. The family sleeps without cover when the elements allow. Otherwise, they have a tee pee and their beaten-down but reliably functional bus, which they’ve named Steve. Ben’s version of home schooling is extreme and intense. The family only eats what they kill or gather. Ben subjects the children to rigorous — even life-threatening — physical and combat training. Their intellectual training is even more intense. They know five or six different languages and can cite literary, historical, scientific, economics and political references most of us will never know, and their knowledge of the arts is similarly extensive. They don’t just memorize things; they process rationally and understand them thoroughly. The family is highly spiritual and contemptuous of organized religion, their knowledge of which is displayed in a wonderfully comical scene where it plays to their advantage. The entire family is lightning-fast in their thinking and they forever strive to refine their ability to learn, reason and debate. No fact is sugar coated in Ben’s explanations to the children, including their questions about sexuality and death. In an unexpectedly brutal opening, the oldest of the children, Bo (George MacKay) pounces on and kills a deer with a knife, after which Ben proclaims Bo is now a man, then gives him the deer’s liver to eat, or at least take a primal bite out of. We then see scene after scene of their training in the areas I mention in the paragraph above. For the little money the family’s lifestyle requires, they make crafts, which are sold by a store owner in the local town. We learn Leslie, Ben’s wife and the mother of the children, has not been with the family for the past two weeks because she is in the hospital — an institution (one of many) the family abhors — for depression. It was in the hopes of helping with Leslie’s depression that the family decided to remove themselves from society and live in the wild before the youngest of the children were born. The family goes into town to pick up their mail (Scientific American and National Geographic are the magazines most prominently displayed). When Bo encounters a group of teen girls at the store, his awkwardness leads us to believe the only females he’s been exposed to are his family members. The drawbacks of their idealistic lifestyle start to become apparent and graphic and — when the youngest children first encounter obese people — comical. While in town, Ben calls his sister Harper (Kathryn Hahn) for a status on Leslie, only to find out Leslie has committed suicide, which we learn was not unexpected but still understandably hard for the family. It’s at this point we learn of the antagonistic relationship Ben has with Leslie’s wealthy father Jack (Frank Langella), who blames their lifestyle on Leslie’s declining health and death. Jack sternly and angrily tells Ben they are preparing Leslie’s funeral near his home in New Mexico (where Leslie was hospitalized), despite Leslie’s will stipulating that, because she was a Buddhist, she be cremated and not buried. Understandably upset and needing to lash out, he blames Ben for Leslie’s (Jack’s only child) death and threatens to have Ben arrested if he shows up at the funeral. The rest of the film shows the family on their bus trip to and their arrival in New Mexico, thus becoming a road movie. They stop at Harper’s family’s home on the way, which reiterates their detachment from current American society, most effectively displayed using the differences between Ben’s children and Harper’s video game and smart phone-obsessed sons. More stops on the trip offer further examples of the pros and cons of the lifestyle the family leads. When the family shows up unwelcome and unexpected at Leslie’s church service — determined to “save” Leslie to carry out her wishes — the confrontation fully fleshes out the relationship between Ben and Jack. There are contradictions throughout the film. When the family stops at a pancake house for breakfast, Ben decides to leave without ordering, explaining that there is no “real food” on the menu, yet when they go “shopping” at a supermarket, the cart is filled with processed foods. That same scene exhibits another of the film’s conflicting messages: For all the moral high ground Ben teaches the kids, he fakes a heart attack to distract the store’s employees so the kids can bag their food and race the shopping cart to the bus without paying. For a quick moment your reaction is to laugh and think the family is clever but you quickly realize what has happened isn’t right and we just witnessed a theft. For all their emphasis on being healthy and natural, Bo isn’t repelled by the cigarette taste he had to have experienced in kissing Claire (Erin Moriarty). I guess at that age and given his background, the sense of taste is insignificant when it comes to hormones. The way the family avoids getting a ticket during a traffic stop likewise conflicts with the high morals Ben teaches. With Mortensen’s outstanding performance leading the way and strong support from Langella, MacKay and a quick, sparkly, savvy cameo from Missy Pyle, all the acting is convincing. Steve Zahn, playing Harper’s husband Dave, adeptly exhibits the unsure footing a husband/father/brother-in-law in his position would have when Ben’s family stops by on the way to New Mexico, as good a collision of the two worlds as the film offers or that you’ll see in any context. The backdrops, ranging from the Pacific Northwest rain forests to the New Mexico desert and corresponding southwest architecture of the church and homes, are viscerally pleasing. As I mentioned, of the 2016 films I’ve seen thus far, “Captain Fantastic” is the one I’ve found the most satisfying. I learned how brain-lazy I am, how little I know, and how poorly I word myself and the feeling is exhilarating. A buddy explained to me a while back that “interesting” is not a legitimate adjective because of how vague it is, a point hammered home effectively in the film. “Captain Fantastic” makes you think about how quick we are to assess what a “good” or “bad” person or action is and how, within the context of storytelling, we have an inherent need to take sides so we know who to root for and against. For all his idealism and high standards, Ben is morally inconsistent and flawed. Where Jack comes across as someone we see in an adversarial and hateful way at first, we drop our guard as we ultimately find his points are valid, compassionate and caring. “Captain Fantastic” is dramatic, intense, hilarious, conflicting and contradictory and, most of all, thought-provoking on several levels and in different ways. Unlike the year’s other big features and Best Picture nominees, there are lessons in the film that actually apply to our lives — as progressively more brain-lazy and social media-obsessed Americans — to the point it almost feels interactive. The conclusion we make is that we’re all wonderfully complicated and complex, which is part of being human, and we shouldn’t want it any other way. Once again, your review has inspired me to place this film on my list of movies to watch.